Each ULTRA™ is self contained, has a long shelf-life, identifies groups as well as specific HME precursors – and can be carried in a shirt pocket. For these reasons, the ULTRA™ test kits are the top choice for battlefield use by military EOD teams, by police bomb squads for the identification of suspected precursors & chemicals used in the making of explosives, and in security screening. 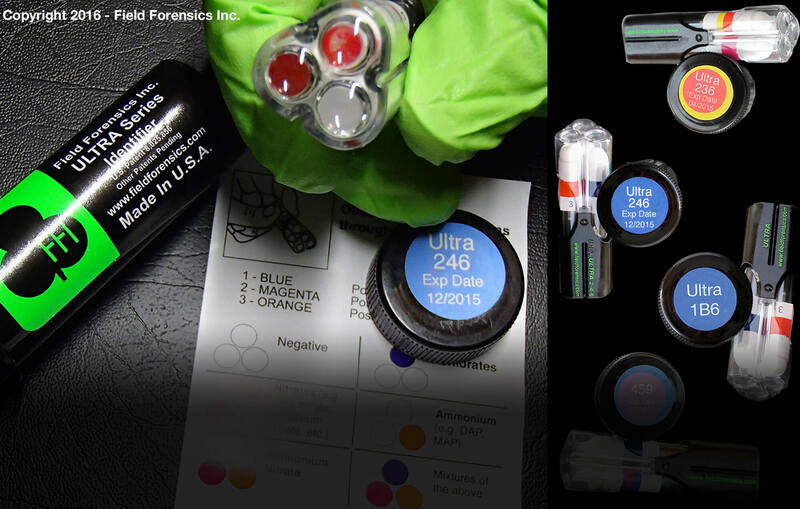 ULTRA™ kits generally react to chemicals immediately or in a few seconds. The user doesn’t have to worry about losing components, or replacing or recharging batteries – the tests are self-contained, simple, rugged and reliable. ULTRA™ is intelligently designed. Even the packaging can be used to transport a sample of material for later analysis. A forensics label is included to properly mark the sample with date, time, case number, etc.